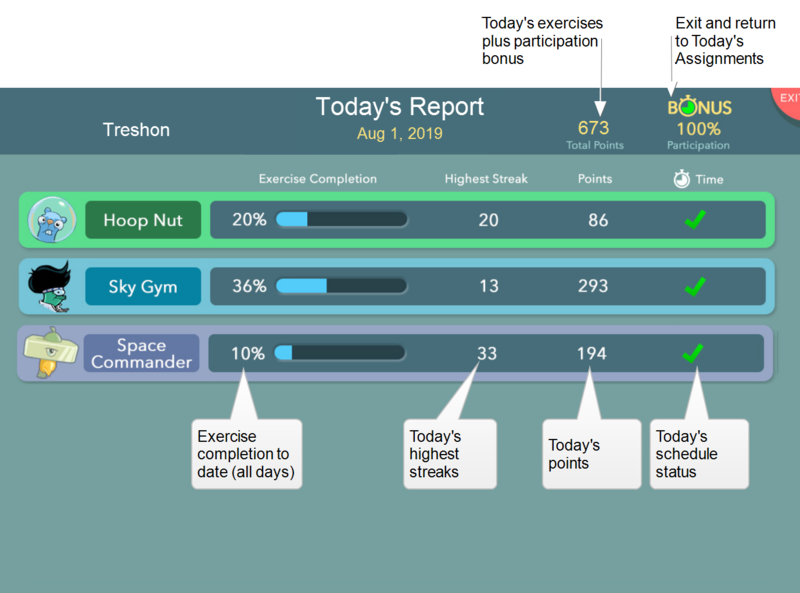 At the end of each session, the Fast ForWord program calculates the results from the day’s work and displays those results on the Today’s report. This provides the student with an immediate review of today’s scores, as a reward and a motivation to continue working on the exercises. Exercises that are not in today’s schedule are not included in this report. You can see points and totals for all exercises in the student’s Weekly Achievement Report. Today’s points shows all points earned today in today’s exercises only, including any participation bonus points. The student earns 100 bonus points by completing all exercises scheduled for the day. The student will see a fun animation that awards the bonus points, so the student will be aware of them, but the report does not list them separately. Total points shows the grand total points earned to date in today’s exercises only. This total also includes today’s participation bonus points, if any. The starred area on the right shows the total number of highest streak scores from today’s exercises. Highest streak shows today’s highest streak of consecutive correct responses in each exercise today. Today’s points shows the points earned in each exercise today. Total points shows the total points earned in each exercise to date. Percent complete shows the percentage of content completed in each exercise to date. Tip: The number of points earned in an exercise does not always reflect the student’s performance in that exercise; instead, points are used to reward correct answers and to encourage the student to continue working on the products.